"The problem is 80 percent of Afghan women are not literate, and they don't have the means to solve their problems so they resort to extreme and desperate measures, like suicide," he said. After regular beatings, torture and attempted murder by her husband, 35-year-old Zahra tried to burn herself to death to escape her marriage. Then she learned of a safer option: divorce. Zahra is among a growing number of women in Afghanistan's western Herat province who, with the help of a women's charity, have taken on patriarchal laws to get a divorce, a taboo in the devoutly Muslim, formerly Taliban-led state. "I did not spend a single happy day with my husband ... he was not like a human being. He used to beat me every day," she said, revealing scars on her right leg and feet where her husband had deliberately given her electric shocks. After marrying at 14, Zahra, who declined to give her full name for her own safety, said she suffered years of abuse. Then a property dispute with her in-laws turned her marriage into a full-blown nightmare. "They wanted to kill me three or four times. Once they gave me rat poison ... I cannot go out because of the divorce and my four brothers are looking for me; they are after me to kill me." The divorce led to her father disowning her and cost her custody of her seven sons and two daughters. Initially her ex-husband let her keep her daughters on condition that she didn't remarry. But her financial circumstances were so dire in a country where women rarely work that she eventually remarried and when her ex-husband found out he took the daughters back. Suraya Pakzad runs a safe house for women in Herat and has helped several women, including Zahra, divorce their husbands. She says her outreach programmes, which inform women about divorce, discourages them from burning themselves and helps them tackle divorce law. The number of divorces have doubled in Herat over the past two years, according to Pakzad, while reported cases of self-immolation have declined. 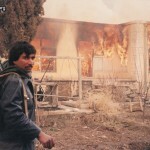 "In 2006 we had 98 cases of women killing themselves with fire ... in 2008, there was about 73 cases, so there has been a definite decrease," Pakzad said. "When we brought the number of self-immolation cases down, automatically the number of divorces went up because women realised that they could not solve their problems by burning themselves," she said. Under Afghanistan's Islamic law, a man can divorce without needing his wife's agreement. But if a woman seeks a divorce then she has to have the approval of her husband and needs witnesses who can testify in court that the divorce is justified. "A man can, with great ease, tell the court that his wife's behaviour is inappropriate, that she does not behave in the home, and wants to divorce her. A man decides a woman's future with one piece of paper," said Maria Bashir, chief prosecutor in Herat. A woman can appeal for a divorce on grounds that her husband is absent for a long time, he cannot adequately provide for the family, either financially or because he is physically incapable, or if he is impotent or abuses her to the point where her life may be at risk, Bashir said. To get their husbands' agreement for the divorce, women were usually forced to let the husband and his family keep the children, a prospect that dissuaded many battered women. "Women prefer death to the pain of being separated from their children ... This is why many women, before consulting the law, will resort to self-immolation, or suicide or running away." Pakzad moved her office from Kabul to Herat, which is a much more conservative town compared with the capital, even though it is perhaps Afghanistan's most prosperous city due to greater security and flourishing trade with bordering countries. "In Kabul, women's access to finance or the economy is much more limited compared with Herat, but they have much better access to freedom. The atmosphere is easier for women and more relaxed," Pakzad said. "Afghan families think that a woman should not be divorced, whatever she goes through, she should be patient and put up with it. She should die before asking for a divorce," Pakzad said. Pakzad links the women with one of five or six law firms in Herat which take on divorce cases. They are mostly defence lawyers and attend court with the woman who is also able to appeal her case if the ruling is unsatisfactory. But the expense, difficulty of access to legal professionals and immense stigma the process brings ensures that most women will never take their cases to court because the burden of proof rests on their shoulders. "Women know this and that's why they tend to put up with their problems," Pakzad said. "We don't want to work against the law. We have an enemy in the Taliban and we don't want to create another enemy out of the government but the law needs to change and we need a (parliamentary) session on this to change it." A few miles away, in Afghanistan's only hospital ward dedicated to "khod soozi", or self-burning, Dr Mohammad Aref Jalali stands over one his patients and asks how she feels. 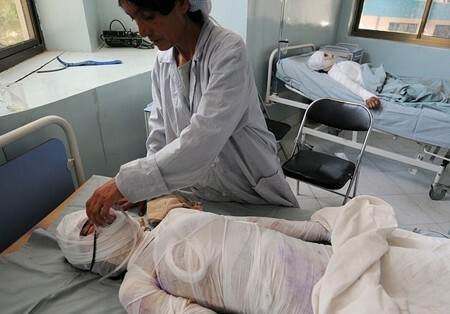 Twenty-year old Zarbakht's entire body is cocooned in white plaster. She lies in bed on her back all day, like a mummy. She can barely move her lips to speak and her eyebrows, partly burned off, are knitted in pain. She says her family never visits. "I had to marry at 14. I was compelled to marry because my family are so poor ... I had no other way. After five years I couldn't take it anymore, what else was I supposed to do?" Zarbakht said in a strained whisper, her jaw almost clamped shut by bandages. For Dr Jalali, who confirmed there were slightly fewer self-immolation cases in Herat so far this year compared with 2008, it comes as no surprise that divorce is not something his patients are ever likely to contemplate. Last year, of the 85 patients admitted to his ward, 63 died of their self-inflicted burns. Back in Pakzad's office, a 21-year-old woman from the northern province of Kunduz smiles shyly as she sits dressed in a white chador decorated with swirly white flowers. She ran away from her husband, who beat her for not being able to have a baby and refused to accept that he was infertile despite diagnoses from three different doctors. She was 12 years old when they married, he was 32. The woman, who declined to give her name due to fear of her husband, did not have anywhere to turn to in Kunduz, 750 km from Herat. She made her way to Herat alone after hearing about Pakzad's organisation. Her husband has agreed to a divorce but demands that she pay him 60,000 afghanis ($1,200) to refund him for the cost of marrying her or find him an alternative wife. The woman, who is literate, is working in several jobs including teaching to pay her husband back. "I hope that one day we can be in a position to help other women in the world, so that we will no longer be seen as the women the rest of the world sees as helpless ... We are not helpless, history has forced helplessness onto us," Pakzad said.